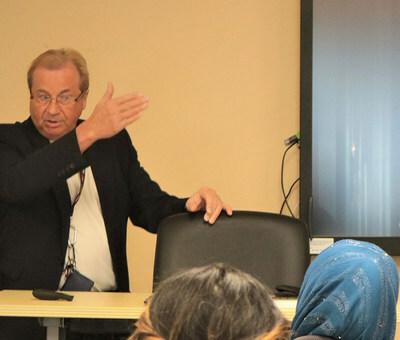 Dr. Don Penney, MD, MSC, FACEP., during a lecture at the IMGC Simulation Lab. Dr. Don Penney, MD, MSC, FACEP., recipient of “Top Surgeons in America” award by Consumer Research Council of America for 2007, 2009, 2010, 2011, and 2013. Dr. Penney serves as the Dean of Clinical Affairs at American University of Integrative Sciences and has been a leader in medical practice and education for many years. Dr. Penney is a recipient of the Prince Phillip Silver Medal from the University of Toronto for earning the second highest grade point average at Graduation. The Clinical Encounter: Organ-System Lectures, Physical Examination and OSCE by specialists. To be included for student transcripts and MSPE on successful completion of the full program. Recording of the EPAs that have been met. Guaranteed pass on the Canadian or USMLE Step 2 CS exam, as long as the student follows the guidelines and format as demonstrated by Dr. Penney, MD. Module 1. The Clinical Encounter: Lectures, Physical Examination and OSCE. Instructors: Sessions to be led by invited Specialists in their field(s). Neurosurgeon, Pulmonologist, Intensivists, Rheumatologist, Orthopedic surgeon, among others. Use of Standardized patients. Intended Outcomes: Assessment and documentation of proper history taking and physical examination techniques qualifying the student for Step 2 CS success. Instructors: A radiology lecture series on CT, MRI, Chest, Abdominal X-rays interpretation by a Radiologist that will address current common student weaknesses. Lectures will be supported with discussions of case studies and real patient scenarios and slides. Intended Outcomes: A complete radiology review prior to starting most clerkship(s). Instructors: the US Licensed and practicing physician(s) on Suturing; Intravenous Therapy; Phlebotomy; Advanced Airway /Intubation; Spontaneous Vaginal Delivery; Lumbar Puncture (Adult & Child); Central, femoral and other Lines; Scrub Lab/Aseptic Technique. Intended Outcomes: Utilizing simulators students will learn and demonstrate the proper techniques for each of these advanced skills. Instructors: Led by Instructors trained with the American Heart and Lung Association. Intended Outcomes: Year 3 students require ACLS /BLS certification prior to beginning their clerkship.